You are hereForums / General Discussion / 2011 TBA Chili Ride was a Hugh Success! 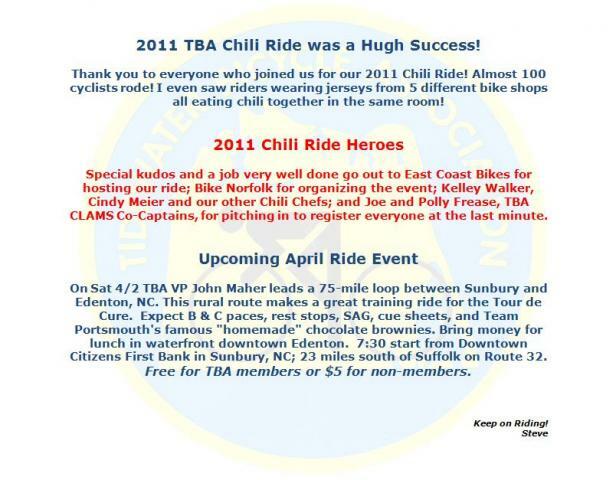 2011 TBA Chili Ride was a Hugh Success! Thank you to everyone who joined us for our 2011 Chili Ride! Almost 100 cyclists rode! I even saw riders wearing jerseys from 5 different bike shops all eating chili together in the same room! Special kudos and a job very well done go out to East Coast Bikes for hosting our ride; Bike Norfolk for organizing the event; Kelley Walker, Cindy Meier and our other Chili Chefs; and Joe and Polly Frease, TBA CLAMS Co-Captains, for pitching in to register everyone at the last minute. On Sat 4/2 TBA VP John Maher leads a 75-mile loop between Sunbury and Edenton, NC. This rural route makes a great training ride for the Tour de Cure. Expect B & C paces, rest stops, SAG, cue sheets, and Team Portsmouth's famous "homemade" chocolate brownies. Bring money for lunch in waterfront downtown Edenton. 7:30 start from Downtown Citizens First Bank in Sunbury, NC; 23 miles south of Suffolk on Route 32. Free for TBA members or $5 for non-members.